Death Comes to Pemberley: By P.D. James, Faber &amp; Faber, 320 pages, ₹ 499. I owe an apology to the shade of Jane Austen for involving her beloved Elizabeth in the trauma of a murder investigation," writes P.D. 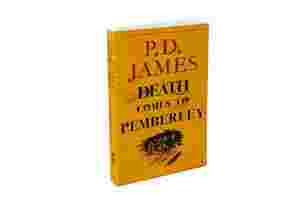 James in an author’s note at the beginning of her latest work of crime fiction, luridly titled Death Comes to Pemberley. Only half of that statement is right. James does owe Austen a debt of apology, but not for the reason she suggests. While she creates a compelling enough murder mystery, packed with evocative detail, James is just, well, not funny. Above all, Austen was a wonderful writer of comedy; she used her gift for humour to enrich what might otherwise have been provincial domestic romances into something much, much finer. Death Comes to Pemberley: By P.D. James, Faber & Faber, 320 pages, ₹ 499. Surprisingly, James puts the matter of reviving Elizabeth to one side and instead expends most of her efforts in a laboured, 50-page exercise in scene-setting. It is the day of Lady Anne’s ball at Pemberley and a litany of domestic detail about “white soup" and cut flowers eases us into life in the great house before the crisis occurs: Our heroine’s wayward sister, Lydia, stumbles out of her carriage in the dead of night screaming murder. Elizabeth, we are repeatedly told, is blissfully happy as chatelaine of Pemberley. She’s the perfect wife and mother: She’s kind to the servants, she has adorned the nursery with two strapping boys, she’s charmed the pants off the formidable Lady Catherine de Bourgh and she is totally and unexpectedly in thrall of her husband and his house. As she tells her sister Jane, “I suspect that with Mr Darcy, Pemberley comes first. I remember when I first visited... my obvious delight in it pleased him. If I had been less than genuinely enthusiastic I don’t think he would have married me." Early on, we are given the hopeful signal that “Georgiana (Darcy’s young sister) had been surprised, almost shocked, to hear her brother being teased by his wife, and how often he teased in return and they laughed together." Sadly, Elizabeth and Darcy are exhaustingly and dutifully polite to each other here. Darcy is still a rather gnomic figure, but, devoid of his sarcasm, has become pompous. About halfway through the novel, it’s hard to avoid the unhappy conclusion that the romantic leads have become what Helen Fielding would call “smug-marrieds". It’s an understandable fault, and perhaps the reason that James tries to focus on minor characters from the village as the mystery unfolds. Elizabeth’s voice was an echo of Austen’s own, a voice so distinctive and with an idiom so inimitable that any attempt to recreate it seems doomed to failure. As a murder mystery, Death Comes to Pemberley works fine. But fans of Austen, and particularly of Elizabeth, are bound to be disappointed if not a little depressed by the guileless and pedestrian version of Austen’s heroine that James has painted.